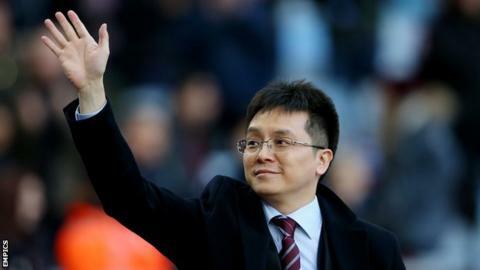 Aston Villa's owners, Dr Tony Xia's Recon Group UK, have made a loss of £14.5m for the 2016-17 season. That is a significant reduction on the £80.7m loss in Villa's Premier League relegation campaign in 2015-16, their final season before previous owner Randy Lerner sold the club to Xia. Villa's total wage and salary bill (including all staff, not just players) fell from £81.6m to £53.5m. Turnover was reduced from £108.8m to £73.8m, also a fall of about a third. Broadcasting revenue makes up a large portion of this - it now stands at £48m, down from £65m. But gate receipts, commercial revenue and sponsorship were also reduced. The accounts also show a hugely-reduced net outlay on transfers of just £3m, compared to £60.5m the year before, when previous Villa boss Roberto di Matteo spent £12m on Ross McCormack from Fulham and Jonathan Kodjia, who arrived from Bristol City for a fee which could rise to £15m. Most of Steve Bruce's transfer business was done in the January 2017 window, when he bought Brentford striker Scott Hogan (£9m, rising to £12m), Henri Lansbury (£2.75m,) Birkir Bjarnason (undisclosed) and Barnsley pair Conor Hourihane and James Bree (joint undisclosed fee). But these were offset by the sales of Rudy Gestede (Middlesbrough, £6m) Jordan Veretout (Fiorentina, £6.3m), Ashley Westwood (Burnley, £5m), Nathan Baker (Bristol City, £3.9m), Carlos Sanchez (Fiorentina, £2.7m), Jordan Amavi (Marseille, £1.8m loan fee), Leandro Bacuna (Reading, £1.35m). Since then, the only transfer fees Villa have paid have been for Stoke City midfielder Glenn Whelan (£1m) and Hull City wide man Ahmed Elmohamady (£1m). Bruce also brought in the experience of former Chelsea and England captain John Terry and ex-Blackburn Rovers defender Chris Samba last summer, both on free transfers. And he has used up his ration of five loan signings - Manchester United keeper Sam Johnstone and defender Axel Tuanzebe, West Ham winger Robert Snodgrass, Spurs midfielder Josh Onomah and Bournemouth striker Lewis Grabban. "The figures show the gulf that exists when any club drop out of the Premier League. The fall in sponsorship and other commercial revenues can be startling once top-flight status is lost. "They also show how effective Villa have been in rebuilding a squad challenging at the top end of the Championship. A reduction of spending on transfer fees from £60m to just £3m is a big fall and could have easily led to more turmoil. It has been a very large exercise in "steadying the ship". "The Financial Fair Play restrictions were also mentioned as they are clearly a huge factor in what Villa have been able to do since Dr Tony Xia took over. "Should Villa fail to make the top flight, the financial implications will continue to bite as parachute payments dry up. The rewards are huge but the pitfalls of another Championship season are just as big. But overall these figures show a degree of progress and a club that has adjusted to its new financial reality."